Highlights: Cavaliers ties series at 1 against Warriors in Game 2 of 2015 NBA Finals (+Mini-movie) - Balita Boss! The Cleveland Cavaliers tied the 2015 NBA Finals at one game apiece with a 95-93 overtime victory over the Golden State Warriors. This is the first time in NBA history that the first two games of the championship series have gone to overtime. 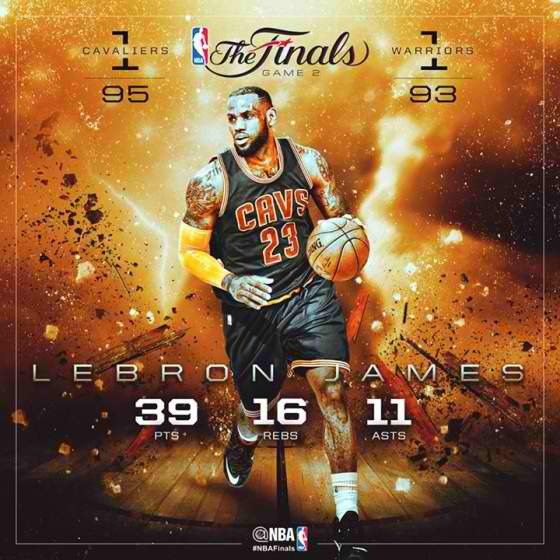 Superstar LeBron James, a four-time NBA MVP, notched his fifth triple-double in a Finals game with 39 points, 16 rebounds, and 11 assists to lead the Cleveland. Timofey Mozgov had 17 points and 11 rebounds, and J.R. Smith contributed 13 off the bench. While James carried the team all evening, Kyrie Irving's replacement after injury, Matthew Dellavedova made two crucial free throws to put Cavaliers up with 10.1 seconds to play in overtime. He also defended NBA MVP Stephen Curry most of the night and finished the game with nine points on 3-of-10 shooting. According to ESPN stats, Curry was held scoreless when being guarded by Dellavedova. Curry finished the game with 19 points six rebounds, five assists with six turnovers, while Klay Thompson had 34 points on 14-for-28 shooting and five rebounds for the Warriors.